Get the tea on underground artists and creative spaces from The Vibe Room! 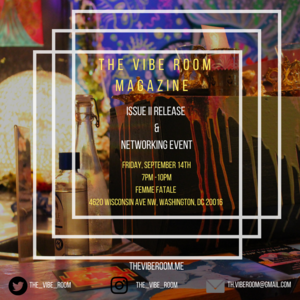 A digital magazine featuring creatives doing exciting things with fashion, music, food, art, and culture in the DMV (DC, Maryland & Virginia). With quarterly issues, it’s a space to watch for up and coming artists and entrepreneurs making our community more unique.